So Silver Bright is the thrilling and heart-breaking ending to the Theatre Illumiata trilogy. It takes all the action, romance, suffering, and adventures that Bertie and Company have gone through in the two previous books, and wraps everything up. I'm in mourning right now, for several reasons, the most prominent being that So Silver Bright is the last foray into Bertie's world that we'll ever get. And, oh, did I love her world. But, I can't be too sad, because this was the perfect ending to the series. After some deliberation, I realized that no matter how it pained me, it had to end that way. 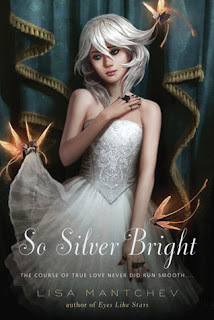 There is no lack of action in So Silver Bright, and it will keep you flipping the pages. Bertie is on the run from the Sea Goddess Sedna's wrath, and it seems like she's being pulled in every which way--she loves Nate, she loves Ariel, she must find her father, perform for the Queen, save the Theater and her mother... How's a girl to breathe with all of that pressure weighing her down? But Bertie, the spunky and fiery heroine who won't stop for anything, finds a way. It was almost amazing to read about how she pulled herself out of any sticky situation, and how she used her magic to her advantage. This series as a whole is just positively magical. What I mean by that is not just the story has to do with magic, but everything about it IS magic. The way Lisa Mantchev writes, her words flowing beautifully, waxing Shakespearian at times, and other times, something else entirely--something only Bertie. Every single character has a spirit and life to them, something that makes them completely unique. And even the world itself is a conglomeration between a fantasy land and modern day, a sort of crossroads where they both meet. Needless to say, I loved So Silver Bright, and the entire Theater Illuminata series. Heartbreaking, but still wonderful. If you're looking for a fantastic, beautiful read, go pick up Eyes Like Stars, and embark on your journey with Bertie. :) 5 out of 5 stars. This book looks amazing! Thanks for a great giveaway! Thanks for the giveaway! This series seems so interesting! I've only read the first book, so I need to read the last two. Everyone says they are fantastic, and I really liked the first. I'm a little worried about the ending of this though because people are also saying that it's sad. Oh, well, I'll have to see for myself. Great review! this series has the best covers! thank you for the contest! I have the first 2 books in the series on my shelf that I need to read, and the covers are so beautiful.